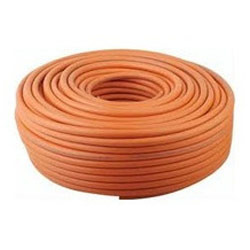 We are a leading Manufacturer & Supplier of Rubber Hose such as Suction Hose, Extruded Rubber Hose, Gas Hose, SS Braided PTFE Hose, Steam Hose, Pneumatic Hoses and many more items from India. We have gained expertise in manufacturing, supplying, wholesaling, trading, retailing and exporting Extruded Rubber Hose. The offered range of hoses is manufactured using high quality rubber, which is procured from reliable vendors of the market. All these products are highly appreciated by customers for their dimensional accuracy and abrasion resistance. 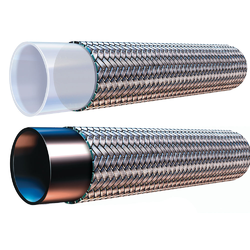 SS Braided PTFE Hose offered to come in smooth bore finish and feature straight PTFE tube with an outer braid of stainless steel wire. 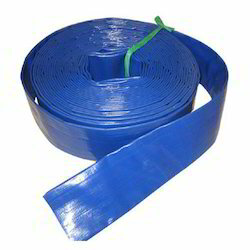 Providing for leak-proof usage, these hoses can also be offered with the support of silicone/EPDM outer covers as per the specifications provided by the customers. Well recognized for their superior temperature resistance properties, these find extensive use in automotive and general purpose applications. Some of its features include providing for high-temperature resistance, have low expansion rates, suitability for use in automotive, steam, high-pressure gas and other applications, having superior resistance to chemicals, almost nil water absorption and others. Beverage Hose offeredcan be made available by us in different finish sizes in PVC material construction as well as supported by polyester reinforcement option with high-pressure. 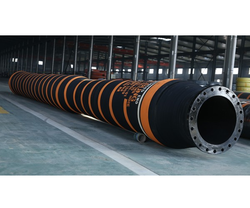 Further, these hoses feature transparent, smooth finish and find application in processes involving conveying water, oil, gas under normal working conditions. Some of its features include providing for flexible, transparent and non-toxic usage; superior anti-erosion and high pressure working support. Fuel Hoses offered can be made available by us with NBR based inner tube finish and high-tensile steel based reinforcement support so as to match up with the specific demands of the customers. 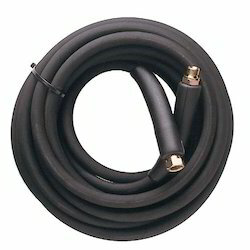 Further, these hoses also feature synthetic rubber cover support. Some of its features include suitable for conveying of fuel, petroleum, oil in gas stations; superior thermal aging, oil resistance and climate resistance. Gasoline Hose offeredcan be made available by us in different configuration options and find suitability for the handling of gasoline and diesel fuel. Some of its features include feature fine wire reinforcement; synthetic rubber cover finish; option of different materials like EPDM, silicone, NBR, Neoprene and others; offering superior anti-ozone and anti-ageing performance; offer anti-ageing or abrasion resistance; can also be made available in OEM specifications. 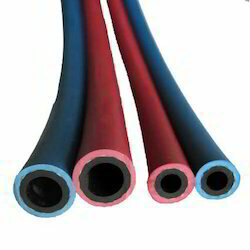 We are leading manufacturer and supplier of Rubber Hose. It is manufactured using quality raw materials and latest technology. Furthermore, these products are checked on various quality parameters to ensure its defect-free nature. 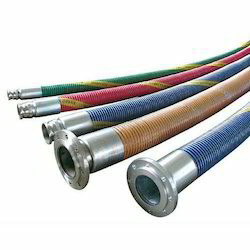 We are a renowned organization, which is engaged in manufacturing, supplying, wholesaling, trading, retailing and exporting high-quality Suction Hose. The offered products are extensively used in diverse industries and acclaimed for their fine finish and durability. Our products can withstand high as well as low temperatures. 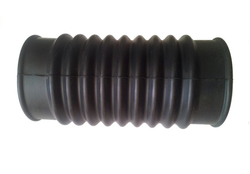 Moreover, these are used as coolant hose for machinery, pipes and connecting hose for food and beverage processing industry. We are instrumental in manufacturing, supplying, wholesaling, trading, retailing and exporting superior quality Heavy Duty Hose. Manufactured using high-quality rubber, these hoses are able to provide excellent functionality and durability for various hydraulic applications. Our range is designed to effectively handle varying pressure, moisture and abrasion. Our domain expertise has enabled us to manufacture, supply, wholesale, trade, retail and export qualitative Oil Hose. The offered product line is manufactured using plasticized PVC, because of this it is resistant to sun and ultraviolet rays. All these hoses are designed for supplying fluid to hydraulic components. Customers can avail our range in various diameters, length and colours at market leading rates. 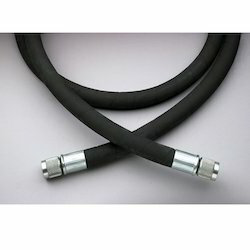 Welding Hose offered is made available in different diameters and lengths as per industry standards and as specified by the customers. We can offer these hoses in different grade and fitting support in single/twin hose styles. 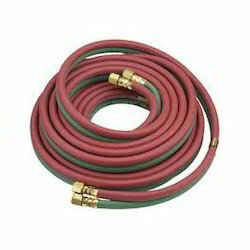 Suitable for use with acetylene fuel, the quality hoses are continuous length hoses that come with oil and flame resistant covering as well as corrugated cover support for added protection from abrasion. Some of its features include availability in different types and sizes, heavy-duty construction finish, coming with suitable covering support for protection from effects of oils, acids and others. 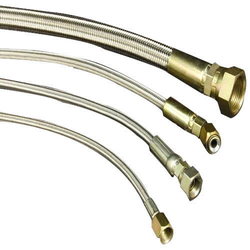 Gas Hose offered comprises stainless steel corrugated tube with a covering of precision weaved stainless steel braid. Further, the tube comes with anti-microbial outer coating support that safeguards the hoses from bacterial growth. 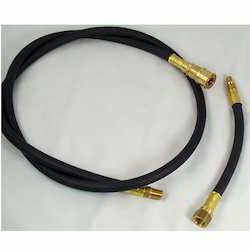 These gas hoses come rated to 5 psi so as to provide perfect support for natural gas. Further, these hoses also remain flexible in low temperatures and match up to the defined industry standards. Some of its features include providing for flexible usage in all weather conditions, coming manufactured to highest specifications, coming 100% tested for smooth and consistent performance and choice of custom made lengths as preferred by customers. Steam Hose offered is made using special rubber compounds that provide desired resistance against the steam ageing effect. In conformance with defined industry standards, these hoses also come with textile reinforcement that offers superior safety support in high temperature and pressure working condition. Some of its features include providing for superior work safety in high pressure and temperature working environment, featuring abrasion resistant cover support, coupling assembly crimp support that reduces leakage possibilities, the capability to handle high temperatures, high-strength steel wire steel braided reinforcement support and others. 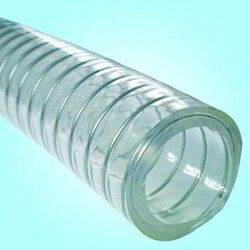 Pneumatic Hoses offeredcomprises an inner tube, middle layer and well as multiple spiral wire reinforcements and cover choices as demanded by the customers. 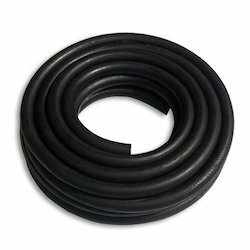 The superior construction of inner tube allows these hoses to effectively handle transmission of liquids under pressure. Some of its features include quality finished high-pressure wire reinforcement hydraulic hose; suitable for use in areas like oil exploration, crane transport, mining equipment, agricultural machinery and others; can handle petroleum base fluids/water-based fluids; comes with the capability of handling higher operating pressures; can offer crimp hose assembly support for customers. 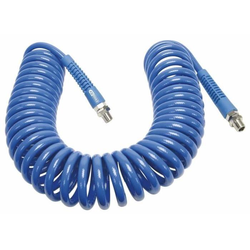 Pool Hose offeredcan be made available in PVC/UPVC material finish as well as in the choice of different finish colours so as to match up with the specific demands of the customers. Some of its features include providing for non-toxic and long service life; lightweight construction finish; excellent design support; superior chemical and corrosion resistance; allows for easy and fast installation; smooth interiors; crushproof structure finish; small bending radius and others. We hold expertise in offering the wide gamut of Reinforced Hose in the industry. This product is manufactured using high-grade input factors as per the preset industry norms. 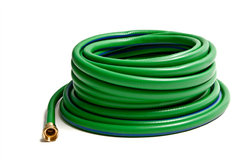 Rubber Garden Hose offered is available in different construction finish choices to pick from and provides for the best combination of lasting service usage as well as economic performance. Marine Hoses offeredcan be made available by us in both standards as well as OEM configurations so as to perfectly match up with the specific end usage demands of the customers. Here, our expertise lies in making these hoses available in both small as well as large quantities with the support of timely order delivery. 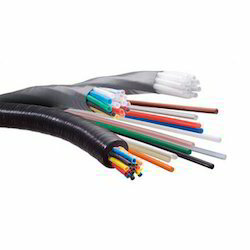 Some of its features include providing for flexible usage support; steel wire braided hose finish; hose featuring inner tube comprising oil synthetic rubber and two-story steel wire braiding support with provision of external rubber cover; suitable for carrying of hydraulic fluids like mineral oils, emulsion, hydrocarbons. 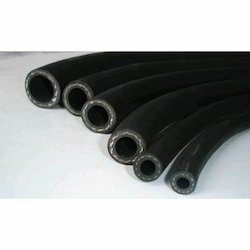 Nitrile Rubber Hose offered are made available by us in different finish configurations and comprise an inner tube, middle layer as well as spiral wore reinforcements and cover support. Further, the quality finished inner tube provides support for transmission of liquid under pressure and as well as provide suitable protection to steel wires against corrosion. Our firm delivers precisely tested and a high-grade assortment of Low-Pressure Hose. It is manufactured using top quality materials and latest technology and tested under various quality parameters. Irrigation Hose offered to provide ideal support for installation of irrigation mainline and sub-line and can be made available in a wide range of diameter and coil options to pick from. Further, these hoses can effectively handle different work pressures and come manufactured from high-grade polyethene resins that provide for maximum resistance to stress cracking and UV degradation. Some of its features include lightweight, soft material construction finish; providing for environmental friendly usage; offering odourless usage; coming developed using state-of-the-art technology for flawless service usage. 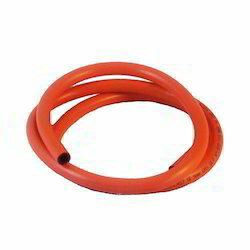 Polyurethane Coiled Hose offered finds use in fuel dispenser and tank and can be made available by is in different industry standards as per the specific demands of the customers. These hoses are suitable for handling of gasoline and diesel fuel with temperature handling capacity with a superior working safety factor. Some of its features include NBR/black smooth inner hose finish; fine wire reinforced reinforcement; synthetic rubber cover finish and others. Air Cleaner Hose offeredcan be made available by us in different finish specifications and can be developed as per sample/OEM drawing demands of customers. Featuring different conformance standards like ES, JIS, SAE and others, these hoses come with superior resistance to high temperature and corrosion. Some of its features include the choice of different reinforcement comprising 3Ply/6Ply polyester fabric; different inner diameter choices; superior ozone resistance among others. Natural Gas Hose offered to provide for flexible working support and come with the support of PE coating that makes these provide for better resistance to corrosion. Further, these hoses also provide for safe working support and provide for firm connections. Some of its features include available in corrosion resistant finish; having long performance life; offering high flexibility and bending support; choice of different wall thicknesses, inner and outer diameters. Composite Hose offered to comprise high-performance multi-layer thermoplastic hoses that come developed using polypropylene/polyethylene/polyester film finish as well as weather-proof and abrasion resistant outer cover construction so as to provide for optimum functional support. Further, the outer cover comes developed in special PU coated fabric so as to provide for superior sunlight and weathering resistance. Some of its features include superior temperature and abrasion characteristic; suitable for use in petrol -chemical industry; wire support available in form of galvanised carbon steel inner wire; specifically designed for some extreme conditions. 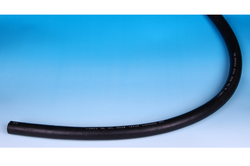 Our firm is involved in manufacturing and supplying a huge range of Rubber Welding Hose. We design the given product following industrial standards by making use of best quality material and modern technology. Garden Hose offeredcan be made available by us in different size options and others in colour options of blue, green, red and others. Further, we can offer these with different connector options of Asian/American/European and others. 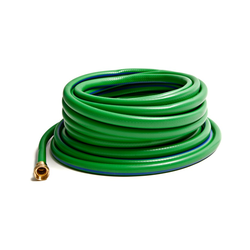 Some of its features include lightweight finish; provide for durable lasting service usage; superior anti-abrasion resistance; suitable for irrigation purposes; reliable all weather hose construction. 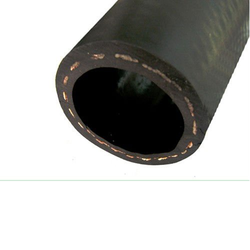 Our company is highly esteemed in offering Steel Wire Rubber Hose to the clients. 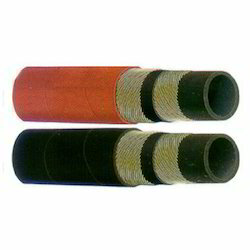 Steel Wire Rubber Hose is mainly used in hydraulic support, oil field drilling, mine is suitable for engineering construction, lifting, transportation, metallurgy forging press, mining equipment, vessels, injection moulding machine and agricultural machine. This product is made and designed by using high-quality components and latest technology under the supervision of professionals. The offered range is also called hose reinforcement wire, steel wire for hose reinforcement, brass coated steel wire and brass plated hose wire etc. 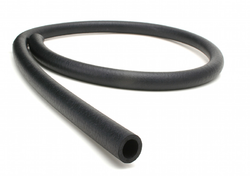 Rubber Hose Assembly offeredcomprise high pressure rubber hose assemblies that come with superior steel wire reinforcement and can be made available in both standards as well as OEM construction choices. Further, these high performance hose assemblies are designed to effectively handle high pressures and can be made available as per different industry standards to choose from like BSP/BSPT/ISO and others. Some of its features include option of braided/spiral steel wire as reinforcement; featuring oil and weather resistant synthetic rubber cover finish; suitable for carrying hydraulic fluids like lubrication, glycol, mineral oils, fuels emulsion, hydrocarbons and others. We are engaged in offering our clients a superior quality range of High-Pressure Hose. We design the given product following industrial standards by making use of best quality material and modern technology. Cement Grouting Hose offeredcan be made available by us in different finish specifications as well as in quality construction finish so as to provide for optimum functional support as demanded by the customers. 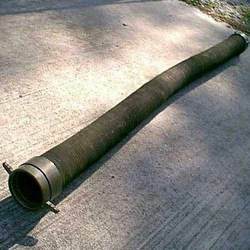 Here, our expertise also lies in offering these concrete delivery hoses as per the needs of customers like in different working pressures, different weight and other working parameters. 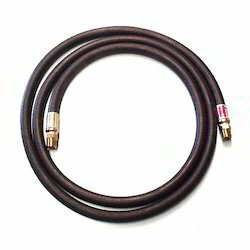 LPG Hoses offeredcan be made available by us in finish specifications as per different industry standards like EN, IO, GB and others and finds use in commercial and residential gas cooking connections. Finding use in transportation of LPG, these hoses come with a superior interior lining that provides for optimum breathability and exterior lining using special rubber for lasting service life.